To assist people with disabilities, exoskeletons must be provided with human-robot interfaces and smart algorithms capable to identify the user’s movement intentions. 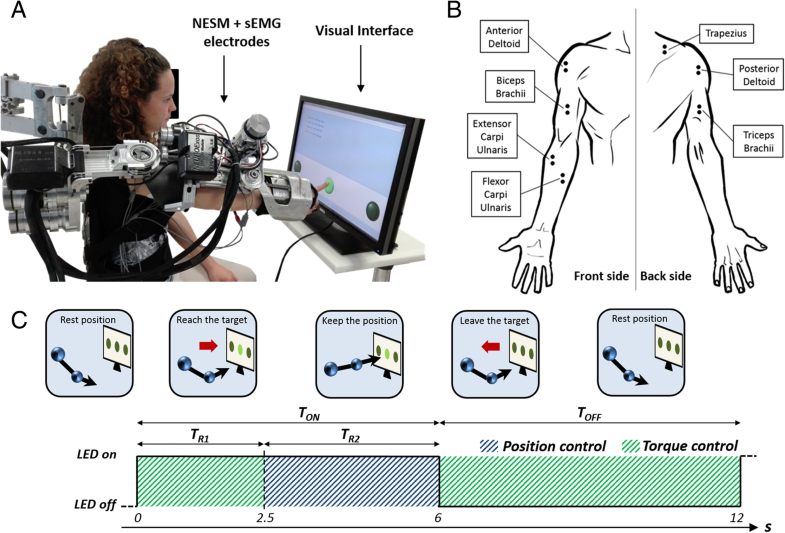 Surface electromyographic (sEMG) signals could be suitable for this purpose, but their applicability in shared control schemes for real-time operation of assistive devices in daily-life activities is limited due to high inter-subject variability, which requires custom calibrations and training. Here, we developed a machine-learning-based algorithm for detecting the user’s motion intention based on electromyographic signals, and discussed its applicability for controlling an upper-limb exoskeleton for people with severe arm disabilities. Ten healthy participants, sitting in front of a screen while wearing the exoskeleton, were asked to perform several reaching movements toward three LEDs, presented in a random order. EMG signals from seven upper-limb muscles were recorded. Data were analyzed offline and used to develop an algorithm that identifies the onset of the movement across two different events: moving from a resting position toward the LED (Go-forward), and going back to resting position (Go–backward). A set of subject-independent time-domain EMG features was selected according to information theory and their probability distributions corresponding to rest and movement phases were modeled by means of a two-component Gaussian Mixture Model (GMM). The detection of movement onset by two types of detectors was tested: the first type based on features extracted from single muscles, whereas the second from multiple muscles. Their performances in terms of sensitivity, specificity and latency were assessed for the two events with a leave one-subject out test method. The onset of movement was detected with a maximum sensitivity of 89.3% for Go-forward and 60.9% for Go-backward events. Best performances in terms of specificity were 96.2 and 94.3% respectively. For both events the algorithm was able to detect the onset before the actual movement, while computational load was compatible with real-time applications. The detection performances and the low computational load make the proposed algorithm promising for the control of upper-limb exoskeletons in real-time applications. Fast initial calibration makes it also suitable for helping people with severe arm disabilities in performing assisted functional tasks. Exoskeletons are wearable robots exhibiting a close physical and cognitive interaction with the human users. Over the last years, several exoskeletons have been developed for different purposes, such as augmenting human strength , rehabilitating neurologically impaired individuals  or assisting people affected by many neuro-musculoskeletal disorders in activities of daily life . For all these applications, the design of cognitive Human-Robot Interfaces (cHRIs) is paramount ; indeed, understanding the users’ intention allows to control the device with the final goal to facilitate the execution of the intended movement. The flow of information from the human user to the robot control unit is particularly crucial when exoskeletons are used to assist people with compromised movement capabilities (e.g. post-stroke or spinal-cord-injured people), by amplifying their movements with the goal to restore functions. In recent years, different approaches have been pursued to design cHRIs, based on invasive and non-invasive approaches. Implantable electrodes, placed directly into the brain or other electrically excitable tissues, record signals directly from the peripheral or central nervous system or muscles, with high resolution and high precision . Non-invasive approaches exploit different bio-signals: some examples are electroencephalography (EEG) , electrooculography (EOG) , and brain-machine interfaces (BMI) combining the two of them [8, 9, 10]. In addition, a well-consolidated non-invasive approach is based on surface electromyography (sEMG) , which has been successfully used for controlling robotic prostheses and exoskeletons due to their inherent intuitiveness and effectiveness [12, 13, 14]. Compared to EEG signals, sEMG signals are easy to be acquired and processed and provide effective information on the movement that the person is executing or about to start executing. Despite the above-mentioned advantages, the use of surface EMG signals still has several drawbacks, mainly related to their time-varying nature and the high inter-subject variability, due to differences in the activity level of the muscles and in their activation patterns [11, 15], which requires custom calibrations and specific training for each user . For these reasons, notwithstanding the intuitiveness of EMG interfaces, it is still under discussion their efficacy and usability in shared human-machine control schemes for upper-limb exoskeletons. Furthermore, the need for significant signal processing can limit the use of EMG signals in on-line applications, for which fast detection is paramount. In this scenario, machine learning methods have been employed to recognize the EMG onset in real time, using different classifiers such as Support Vector Machines, Linear Discriminant Analysis, Hidden Markov Models, Neural Networks, Fuzzy Logic and others [15, 16, 17]. In this process, a set of features is previously selected in time, frequency, or time-frequency domains . Time-domain features extract information associated to signal amplitude in non-fatiguing contractions; when fatigue effects are predominant, frequency-domain features are more representative; finally, time-frequency domain features better elicit transient effects of muscular contractions. Before feeding the features into the classifier, dimensionality reduction is usually performed, to increase classification performances while reducing complexity . The most common strategies for reduction are: i) feature projection, to map the set of features into a new set with reduced dimensionality (e.g., linear mapping through Principal Component Analysis); ii) feature selection, in which a subset of features is selected according to specific criteria, aimed at optimizing a chosen objective function. All the above-mentioned classification approaches ensure good performance under controlled laboratory conditions. Nevertheless, in order to be used effectively in real-life scenarios, smart algorithms must be developed, which are able to adapt to changes in the environmental conditions and intra-subject variability (e.g. changes of background noise level of the EMG signals), as well as to the inter-subject variability . In this paper, we exploited a cHRI combining sEMG and an upper-limb robotic exoskeleton, to fast detect the users’ motion intention. We implemented offline an unsupervised machine-learning algorithm, using a set of subject-independent time-domain EMG features, selected according to information theory. The probability distributions of rest and movement phases of the set of features were modelled by means of a two-component Gaussian Mixture Model (GMM). The algorithm simulates an online application and implements a sequential method to adapt GMM parameters during the testing phase, in order to deal with changes of background noise levels during the experiment, or fluctuations in EMG peak amplitudes due to muscle adaptation or fatigue. Features were extracted from two different signal sources, namely onset detectors, which were tested offline and their performance in terms of sensitivity (or true positive rate), specificity (or true negative rate) and latency (delay on onset detection) were assessed for two different events, i.e. two transitions from rest to movement phases at different initial conditions. The two events were selected in order to replicate a possible application scenario of the proposed system. Based on the results we obtained, we discussed the applicability of the algorithm to the control of an upper-limb exoskeleton used as an assistive device for people with severe arm disabilities. The experimental setup includes: (i) an upper-limb powered exoskeleton (NESM), (ii) a visual interface, and (iii) a commercial EMG recording system (TeleMyo 2400R, Noraxon Inc., AZ, US). NESM (Fig. 1a) is a shoulder-elbow powered exoskeleton designed for the mobilization of the right upper limb [21, 22], developed at The BioRobotics Institute of Scuola Superiore Sant’Anna (Italy). The exoskeleton mechanical structure hangs from a standing structure and comprises four active and eight passive degrees of freedom (DOFs), along with different mechanisms for size regulations to improve comfort and wearability of the device. Soft wearable robots (exosuits), being lightweight, ergonomic and low power-demanding, are attractive for a variety of applications, ranging from strength augmentation in industrial scenarios, to medical assistance for people with motor impairments. Understanding how these devices affect the physiology and mechanics of human movements is fundamental for quantifying their benefits and drawbacks, assessing their suitability for different applications and guiding a continuous design refinement. We present a novel wearable exosuit for assistance/augmentation of the elbow and introduce a controller that compensates for gravitational forces acting on the limb while allowing the suit to cooperatively move with its wearer. Eight healthy subjects wore the exosuit and performed elbow movements in two conditions: with assistance from the device (powered) and without assistance (unpowered). The test included a dynamic task, to evaluate the impact of the assistance on the kinematics and dynamics of human movement, and an isometric task, to assess its influence on the onset of muscular fatigue. Powered movements showed a low but significant degradation in accuracy and smoothness when compared to the unpowered ones. The degradation in kinematics was accompanied by an average reduction of 59.20±5.58% (mean ± standard error) of the biological torque and 64.8±7.66% drop in muscular effort when the exosuit assisted its wearer. Furthermore, an analysis of the electromyographic signals of the biceps brachii during the isometric task revealed that the exosuit delays the onset of muscular fatigue. The study examined the effects of an exosuit on the characteristics of human movements. The suit supports most of the power needed to move and reduces the effort that the subject needs to exert to counteract gravity in a static posture, delaying the onset of muscular fatigue. We interpret the decline in kinematic performance as a technical limitation of the current device. 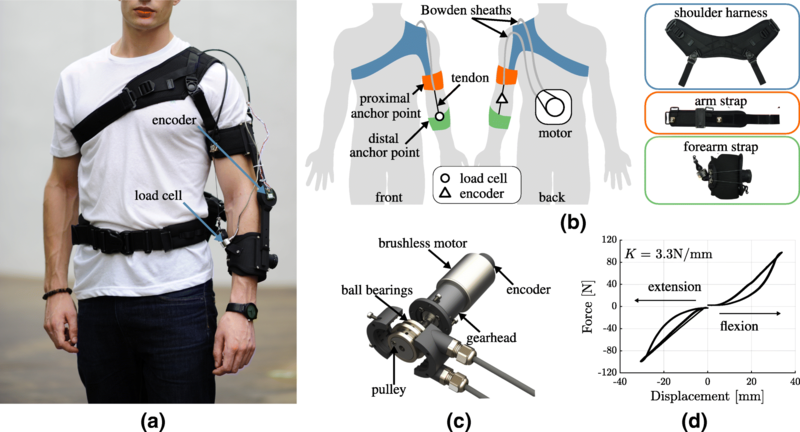 This work suggests that a powered exosuit can be a good candidate for industrial and clinical applications, where task efficiency and hardware transparency are paramount. In the never-ending quest to push the boundaries of their motor performance, humans have designed a wealth of wearable robotic devices. In one of the earliest recorded attempts to do so, in 1967, Mosher aspired to create a symbiotic unit that would have the “…alacrity of man’s information and control system coupled with the machine’s power and ruggedness” . His design of the Hardiman, although visionary, ran into fundamental technological limitations. Advances in materials science, electronics and energy storage have since enabled an exponential growth of the field, with state-of-the-art exoskeletons arguably accomplishing Mosher’s vision . Wearable robotic technology has been successful in augmenting human strength during locomotion , reducing the metabolic cost of human walking [4, 5], restoring ambulatory capabilities to paraplegic patients , assisting in rehabilitating stroke patients [7, 8, 9], harvesting energy from human movements  and helping to study fundamental principles underlying human motor control [11, 12]. These feats were achieved with machines made of rigid links of metal and capable of accurately and precisely delivering high forces to their wearer. While this is undeniably an advantage, it comes at a cost: 1) a significant inertia, which affects both the kinematics of human movement and the power requirements of the device; 2) the need for the joints of the robot to be aligned with the biological joints , resulting in increased mechanical complexity and size ; 3) a strong cosmetic impact, shown to be linked with psychological health and well-being . The recent introduction of soft materials to transmit forces and torques to the human body  has allowed to design wearable robotic devices on the other side of the spectrum: lightweight, low-profile and compliant machines that sacrifice accuracy and magnitude of assistance for the sake of portability and svelteness. Soft exoskeletons, or exosuits, are clothing-like devices made of fabric or elastomers that wrap around a person’s limb and work in parallel with his/her muscles [17, 18]. Characteristic of exosuits is that they rely on the structural integrity of the human body to transfer reaction forces between body segments, rather than having their own frame, thus acting more like external muscles than an external skeleton. Their intrinsic compliance removes the need for alignment with the joints and their low-profile allows to wear them underneath everyday clothing. Exosuits actively transmit power to the human body either using cables, moved by electric motors, or soft pneumatic actuators, embedded in the garment. The latter paradigm was probably among the first to be proposed  and has been explored to assist stroke patients during walking , to increase shoulder mobility in subjects with neuromuscular conditions , to help elbow movements  and for rehabilitation purposes to train and aid grasping [23, 24, 25]. Cable-driven exosuits, instead, include a DC motor that transmits power to the suit using Bowden cables. This flexible transmission allows to locate the actuation stage where its additional weight has the least metabolic impact on its wearer. Using this paradigm to provide assistance to the lower limbs has resulted in unprecedented levels of walking economy in healthy subjects  and improved symmetry and efficiency of mobility in stroke patients . Similar principles were used to provide active support to hip and knee extension, reducing activation of the gluteus maximus in sit-to-stand and stand-to-sit transitions . Cable-driven exosuits seem to work particularly well for lower-limbs movements, where small bursts of well-timed assistance can have a big impact on the dynamics and metabolic cost of locomotion . Yet, Park et al. have shown that they have the potential for assisting the upper-limbs in quasi-static movements too: using a tendon-driving mechanism, a textile interface and an elastic component they found a significant reduction in the activity of the deltoid muscle when supporting the weight of the arm . Similar results were reported by Chiaradia et al., where a soft exosuit for the elbow was shown to reduce the activation of the biceps brachii muscle in dynamic movements , and by Khanh et al., where the same device was used to improve the range of motion of a patient suffering from bilateral brachial plexus injury . While there is extensive work on the analysis of the effects of wearing a soft exosuit on the kinematics, energetics and muscular activation during walking , the authors are unaware of comparable studies on movements of the upper limbs, whose variety of volitional motions is fundamentally different from the rhythmic nature of walking. Understanding how these devices affect the physiology and mechanics of human movements is fundamental for quantifying their benefits and drawbacks, assessing their suitability for different applications and guiding a continuous data-driven design refinement. In this study we investigate the kinematic and physiological effects of wearing a cable-driven exosuit to support elbow movements. We hypothesize that the low inertia and soft nature of the exosuit will allow it to work in parallel with the user’s muscles, delaying the onset of fatigue while having little to no impact on movement kinematics. We propose a variation of the design and controller presented in [32, 34] and introduce a controller that both detects the wearer’s intention, allowing the suit to quickly shadow the user’s movements, and compensates for gravitational forces acting on the limb, thus reducing the muscular effort required for holding a static posture. We collect kinematic, dynamic and myoelectric signals from subjects wearing the device, finding that the exosuit affects motion smoothness, significantly reduces muscular effort and delays the onset of fatigue. The analysis offers interesting insights on the viability of using this technology for human augmentation/assistance and medical purposes. An exosuit is a device consisting of a frame made of soft material that wraps around the human body and transmits forces to its wearer’s skeletal structure. In a cable-driven exosuit, artificial tendons are routed along a targeted joint and attached to anchor points on both of its sides. When the tendons are tensioned they deliver an assistive moment to the joint. The exosuit for assistance of the elbow joint presented in this paper (shown in Fig. 1a, b) follows exactly this principle. It comprises of three fabric straps: one around the forearm (distal anchor point), one around the arm (proximal anchor point) and a shoulder harness, connected to the arm strap via adjustable webbing bands. Buckles, velcro straps and a Boa lacing system allow to tighten the suit. 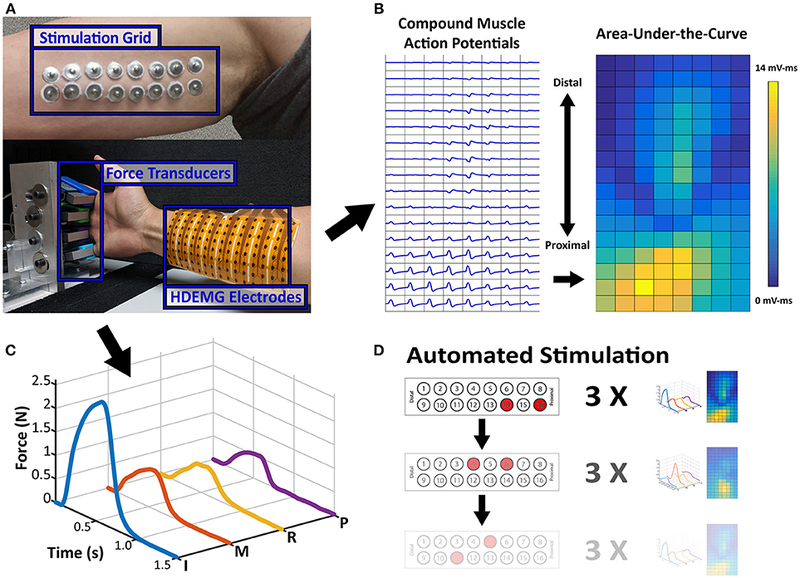 Purpose: A transcutaneous proximal nerve stimulation technique utilizing an electrode grid along the nerve bundles has previously shown flexible activation of multiple fingers. 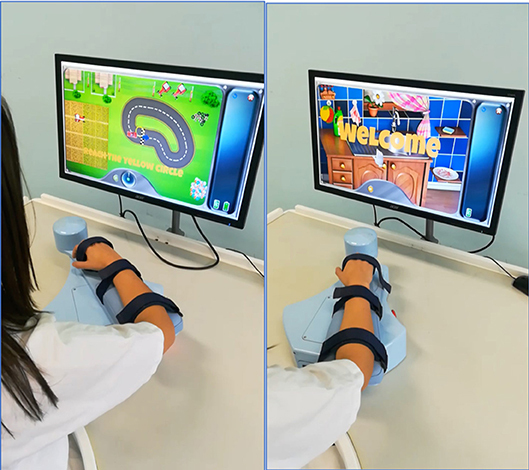 This case study aimed to further demonstrate the ability of this novel stimulation technique to induce various finger grasp patterns in a stroke survivor. Methods: An individual with chronic hemiplegia and severe hand impairment was recruited. Electrical stimulation was delivered to different pairs of an electrode grid along the ulnar and median nerves to selectively activate different finger flexor muscles, with an automated electrode switching method. The resultant individual isometric flexion forces and forearm flexor high-density electromyography (HDEMG) were acquired to evaluate the finger activation patterns. A medium and low level of overall activation were chosen to gauge the available finger patterns for both the contralateral and paretic hands. All the flexion forces were then clustered to categorize the different types of grasp patterns. Results: Both the contralateral and paretic sides demonstrated various force clusters including single and multi-finger activation patterns. The contralateral hand showed finger activation patterns mainly centered on median nerve activation of the index, middle, and ring fingers. The paretic hand exhibited fewer total activation patterns, but still showed activation of all four fingers in some combination. Conclusion: Our results show that electrical stimulation at multiple positions along the proximal nerve bundles can elicit a select variety of finger activation patterns even in a stroke survivor with minimal hand function. This system could be further implemented for better rehabilitative training to help induce functional grasp patterns or to help regain muscle mass. Following a stroke, a majority of individuals have paresis due to a loss of excitatory input and subsequent complications, such as disuse atrophy (1) and altered spinal organization (2–4). This loss of voluntary control of muscle activation often limits activities of daily living. Neuromuscular electrical stimulation (NMES) has been widely utilized both in the clinic and in research settings to help restore atrophied muscle and lost functions (5–7). Electrical stimulation has been particularly successful with post-stroke survivors for functional recovery (8–10). Research in NMES also aims to restore functional activation of muscles, such as the restoration of hand grasps (11). Traditionally, NMES uses large electrode pads, targeting the distal branches of the nerve, known as the motor point stimulation (12). Although stimulation of the motor point is straightforward methodologically, NMES is limited to localized muscle activation, which limits its functional efficacy and also leads to rapid muscle fatigue (13). Advances in NMES techniques to alleviate these issues involve various multi-electrode techniques, which can stimulate multiple small regions of the muscle to help distribute the current and potentially activate more muscle fibers (14, 15). Crema et al. has also demonstrated flexible activation of multiple fingers using a multi-electrode array across the forearm and hand (16). Other approaches to NMES involve stimulation of the nerve bundle prior to branching and innervating a muscle, which has shown to allow for a larger area of muscle activation and potentially reduce long-term fatigue effects (17–19). Figure 1. Experimental Setup and Data Samples. (A) Stimulation Electrode Array and Force/HDEMG Setup. Processed Data samples are displayed adjacent to the setup figure. (B) The EMG map is the spatial map of calculated AUC values from each EMG channel’s CMAP and (C) the Force Profile is the smoothed force of each finger. (D) Sample Depiction of Automated Stimulation Procedure. Each stimulation pair can be paired with an EMG activity map and a force profile, which is the repetition of 3 stimulations.